August 2010: This Privet/Ligustrum ovalifolium was given to me in August 2010. It had been growing for a number of decades as part of a large hedge in London before being dug up by the owner and planted into a large container in 2009. On initial inspection, the tree didn't have great potential for bonsai, consisting of a number of straight, taperless trunks, all connected at the base. The tree however was in great health and despite having been collected and chopped down from a height of approximately 2 metres the year before, had responded with very strong growth. Privet are an exceptionally resilient plant species and can be treated far more harshly than most other tree species for bonsai. 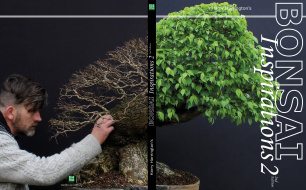 This means that it is possible to carry out aggressive pruning and chopping of the trunk (or trunks) to produce a suitable 'bonsai trunk'. After 'shaping' of the new bonsai-trunk, the remaining live parts of the tree push out many new shoots that can then be used to build a new branch structure. The majority of the time, it is the surface or below-soil-level areas of a collected Privet that make the best bonsai-trunks. The multiple shoots/trunks that emerge from the base of a field- or garden-growing Privet are often too thin and straight in their own right to make a good trunk for bonsai; but their bases do make excellent material albeit with the sometimes extensive use of deadwood and carving effects. Achieving a good trunk for bonsai meant that it was necessary to remove almost all of the multiple shoots/trunks on my tree, leaving just the trunkbase to be developed over the forthcoming years. .........and then ripping them away from the base. More and more of the trunks were removed, each being chopped at a height that increased the taper of the trunkbase. By leaving the bottom of the trunk at the back/left of the tree, the base was given a greater impression of taper. The tops of newly-chopped trunks were also carved using a die-grinder to increase the taper. The trunkbase of the tree here was just under 7"/17cm.